If you want to run Android app on your computer, you’ll probably want to download and install BlueStacks on your computer to do it. BlueStacks is the most popular and most stable app to run Android apps on computer. Its available for both PC and Mac. But when you’ll try to install BlueStacks on your PC, that is, a Windows based computer, its highly likely that you will get the infamous BlueStacks graphic card error. Error 25000. Bluesacks currently doesn’t recognize your graphic card. It is possible your graphic drivers may need to be updated, Please update them and try installing again. Check out the image below to see the exact error you’ll see. 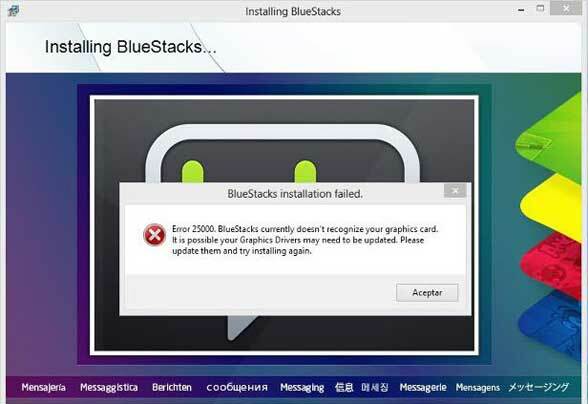 Following this error, the BlueStacks installation will fail and you will probably not be able to install BlueStacks until you fix this error. Here’s how to fix it. • The most easy common sense approach is to restart your computer and try installing BlueStacks again. This approach worked for me. • If restarting your computer doesn’t work, then you need to update the graphics driver on your computer. To do this, right click on the computer icon on your desktop and click on ‘Manage’ in the menu. Now select Device Management > Display adapter. Then right click on it and select ‘Update Driver Software’. Windows will now ask you where do you want to search for the latest version of the device driver. Select ‘Search automatically for the updated driver software’. Windows will now download and install the latest version of the graphic driver on your computer. Now restart your computer and then try installing BlueStacks again. It should install successfully this time. Why you need to Update the graphic driver to install BlueStacks? This is because Android programs use OpenGL for graphics, unlike Windows which uses Direct3D. When Windows is automatically updated in background, Direct3D gets updated but OpenGl is never updated. When you manually update the graphics driver, the OpenGL is also updated to latest version, thus fixing the graphic device of BlueStacks.